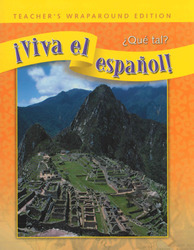 In each Teacher's Wraparound Edition (TWE), you can find the information you will need to plan and implement a course of study during the school year, adapt the program to meet the unique needs of your students, carry out the daily lessons, enrich the language-learning experience, assess student's; progress, and integrate the school's Spanish program into the home and community. The TWE contains a reduced reproduction of the student textbook with Unit Overviews and page-by-page plans in the wrap. These plans include a list of materials an components you'll need, suggestions for extending the daily lessons and for differentiated instruction, informal assessment activities, and the answers to exercises.